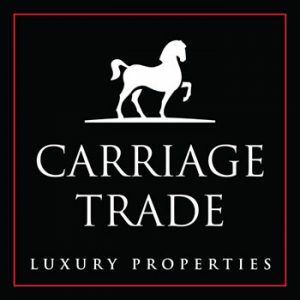 The Carriage Trade luxury property marketing program offers you a wealth of new and evolved marketing, promotional and training resources to elevate your distinguished service. Your luxury listings are prequalified by price and automatically published to carriagetradeproperties.ca as well as royallepage.ca with no further action required from you. You will receive an email notification that your property has been published to the website (with the option to remove it). Enhanced royallepage.ca exposure. Carriage Trade listings also enjoy exclusive exposure on royallepage.ca with Featured Property rotation on the home page and a distinctive Carriage Trade flag. See the qualification criteria and automated publication pages for full details. The refined Carriage Trade identity includes a distinctive and a striking aesthetic that extends across all marketing collateral. Listings data integrated Smart Studio designs feature this striking iconography and, because they are pre-populated with listing photos and property information, they can be created in minutes. Visit the Studio section in Smart Studio to see all the available templates. Certified Luxury Home Marketing Specialist training is available online through rlpNetwork.com at a 15% discount and complimentary 2-year membership in the Institute for Luxury Home Marketing. We also host live training sessions facilitated by industry experts on occasion. Dates will be announced via email. View CLHMS course details.